If you are looking for a stylish and efficient supermini for your travel needs, then nothing will beat the well-equipped Peugeot 208. It is one of the most efficient models and is among the most decked out superminis on the market today when it comes to advanced features and options for interior design. It handles well and is surprisingly stylish for a mini making it one of our more popular models for locals and visitors alike who need plenty of space in their car rentals. With enough space for 5 people and cargo space in the back, there is room for all and with a 5 door set up you can easily access anything you need. 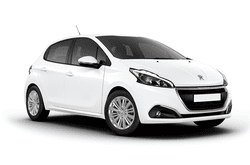 Check it out today for yourself and see why the Peugeot 208 is one of our most requested models!